The Boy is very picky about his work shoes – they have to look nice with slacks but stand up to walking through construction sites. 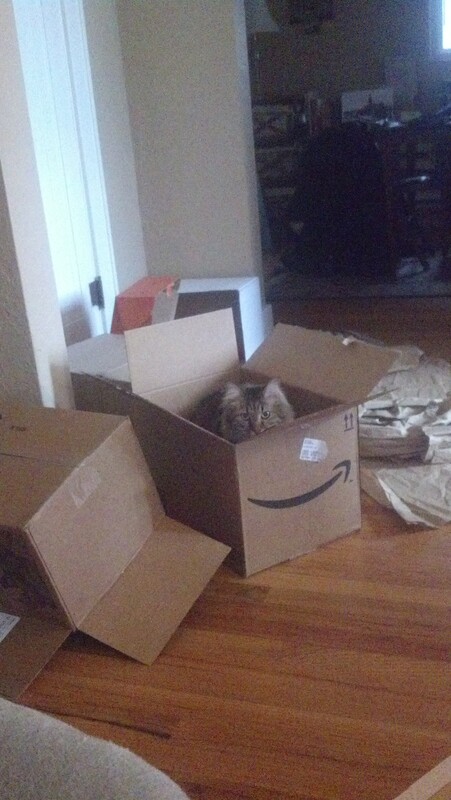 He found a pair that he liked last week, but not in the color he needed, so he had to have them shipped to him. 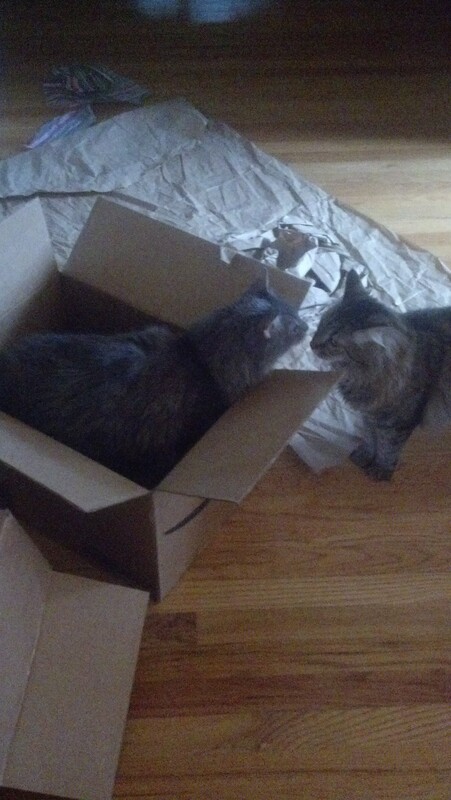 They came in a box. 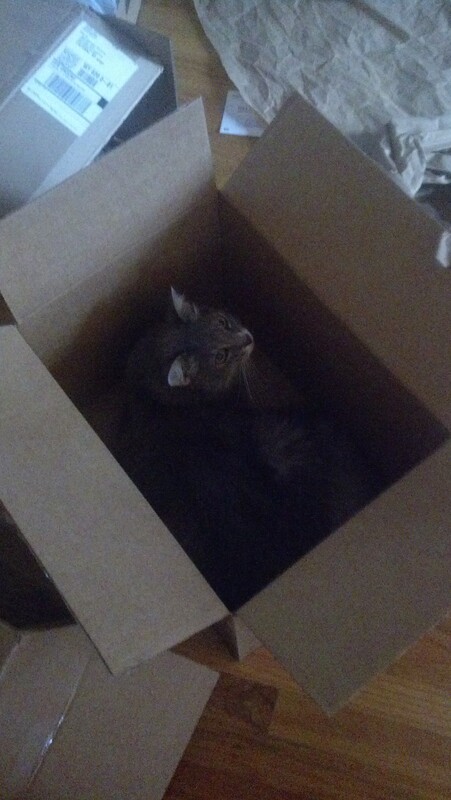 That was in a box. 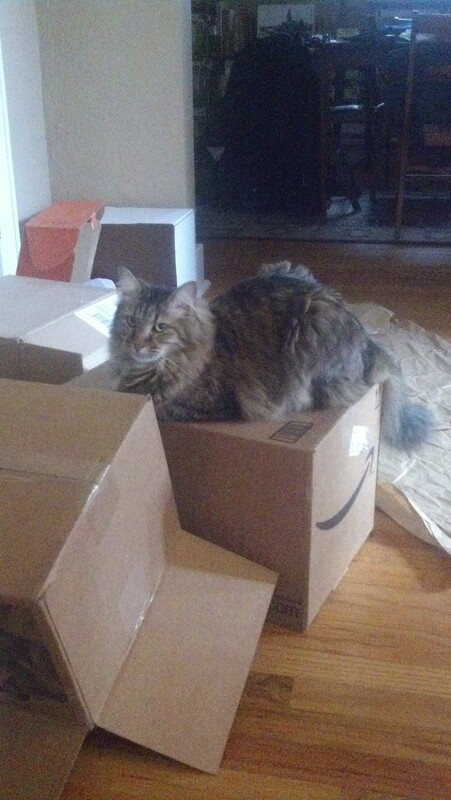 Then, today, I came home and finally noticed Obi sitting on a NEW box. 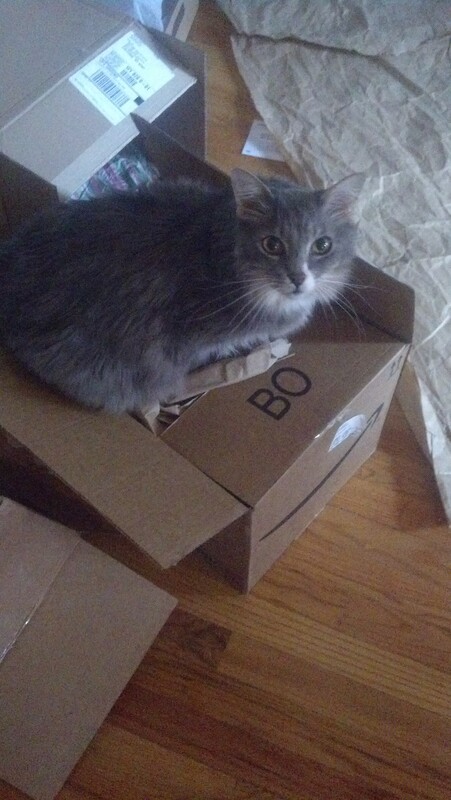 I made him get off the box so I could cut it open. I took two steps away to put the scissors on the coffee table. 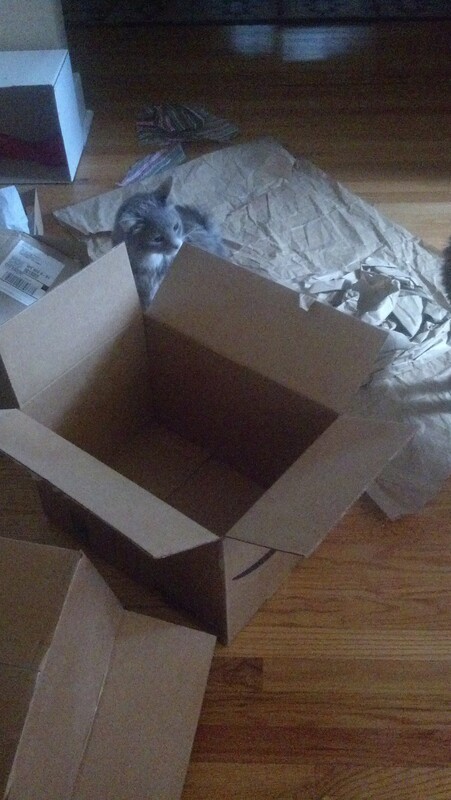 When I turned back around, Oliver was already looking at me – disappointed – because there was stuff in the box. 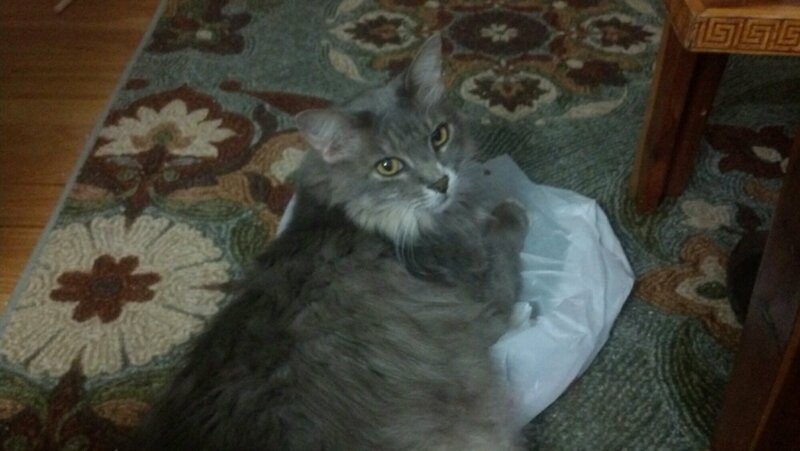 So I emptied it for him. 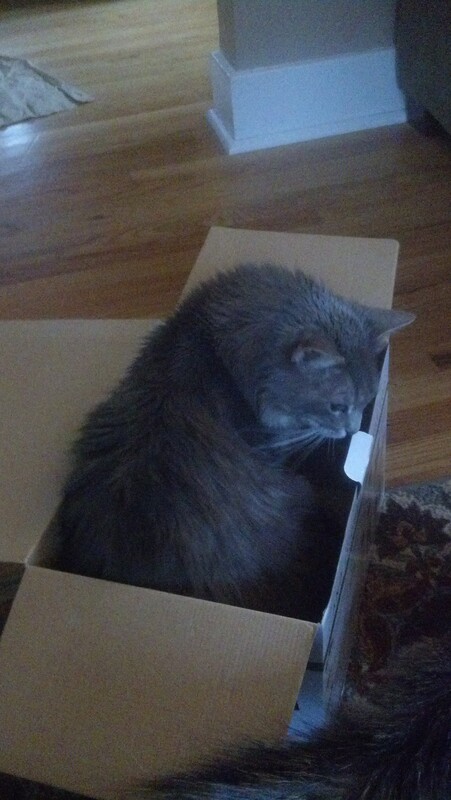 Poor Obi, he got my attention…his brother got the box. But! 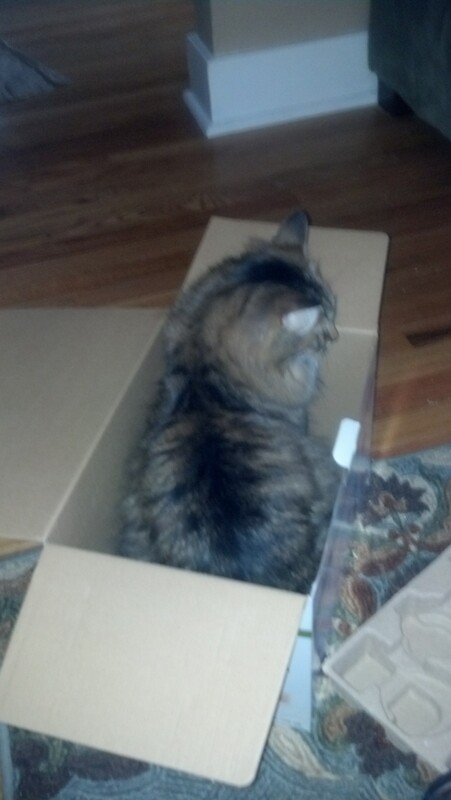 Inside the box, was a box. 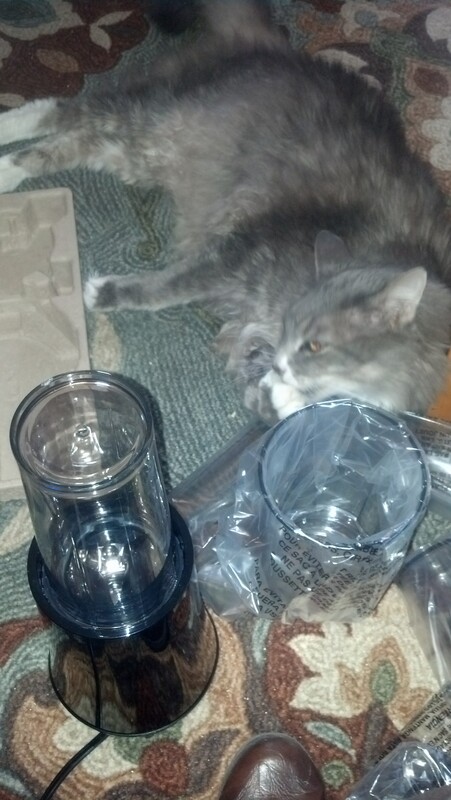 I emptied it quickly and urged Obi to claim it. 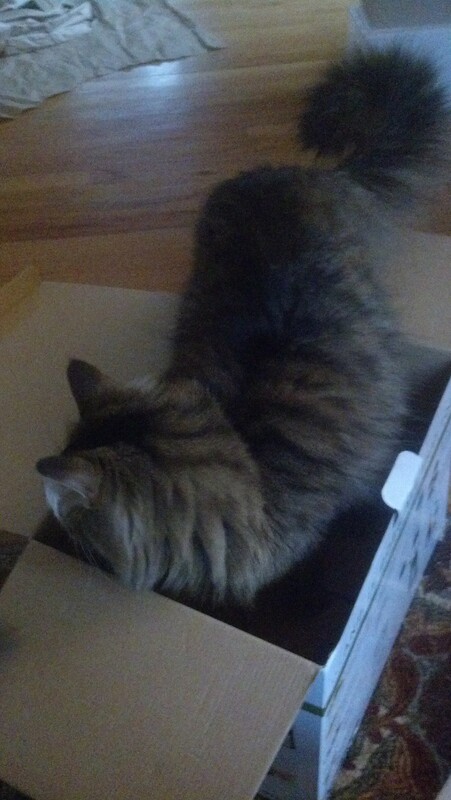 Poor Obi…his brother wanted that box, too. Seems like he got what he wanted all along. So what was in the box inside the box? It is the new blending system that my parents gave me for my upcoming birthday (Saturday). 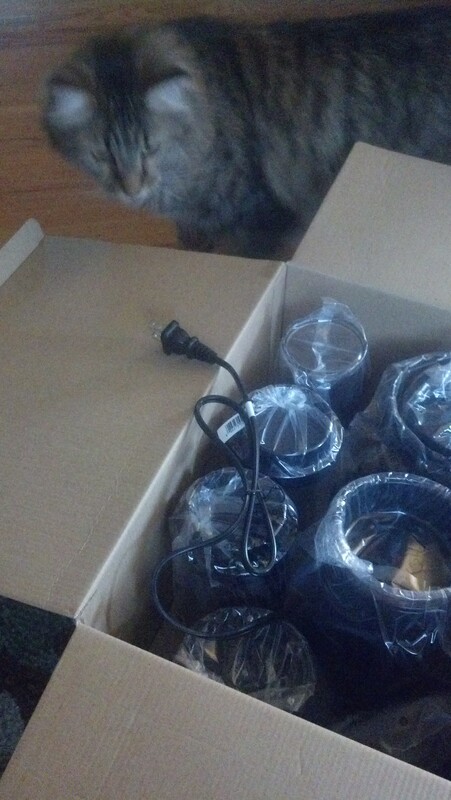 Oliver closely inspected all the contents. Then he must have seen the directions. He washed thoroughly before using. 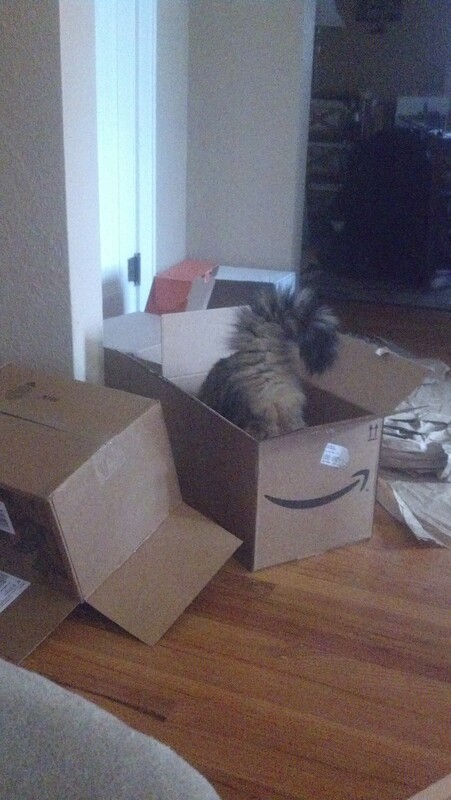 And Obi got the second box as well. I posted pictures once of the breakfast dance – the way Kitten Thunder eats each morning. Oliver will take a couple bites of his food, then go to Obi’s plate, then back to his…lather, rinse and repeat until the food is gone. Obi runs from plate to plate, trying to get some food for himself. I’ve tried to fix this for the brown kitten by putting them in different rooms, but Obi doesn’t like to eat that far away from his brother. And, since there is generally food left after breakfast I figure he’s getting his fill. Yesterday, the plates were in the kitchen so I kicked them into the breakfast nook. They ended up right next to each other. I didn’t think about that at all while I scooped food onto both plates, threw the can away and turned to put the spoon back on the cat food shelf. Oliver was sitting in the middle of the two plates, taking one bite from the left plate and then a bit from the right plate. Left right left right left right. Obi was sitting on the other side of the plates, looking at me pitifully. I patted the brown kitten on the head and picked up him and a plate. I moved them three steps away. 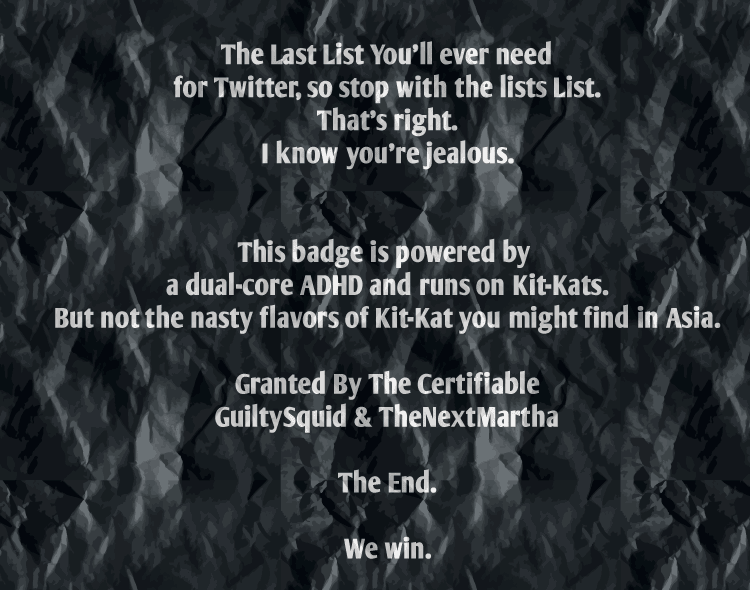 And all was well with the world. The breakfast dance is a tango, not a cha cha. It has been several weeks since we got a new rug. Obi does not approve. At least, that’s what I’m supposed to think. The Boy, though, tells me otherwise. When I’m not in the room, Obi will get his belly rubbed on the rug. If I am on the couch he will not. He’ll go to the rug and let The Boy pet him or brush him. And he’ll wander around looking lost. This evening we proved that it is me that he’s trying to impress with his dissatisfaction. Best Kitteh Sitter in the World, Lori, came over for some quality porch time. 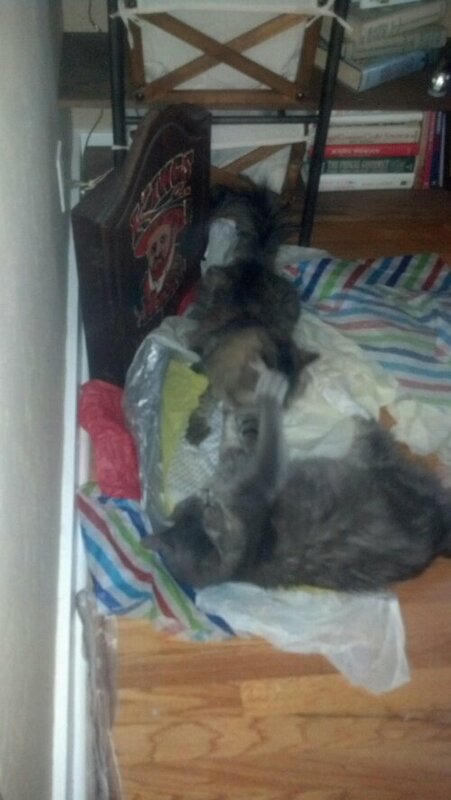 While I was in the kitchen getting a beer, Lori greeted the kittehs. She rubbed Obi’s belly. On the rug as she has been trained to do. The brown kitten jumped up. Brush me, he said. But the damage was done. I had seen the belly. The rubbing. The joy. 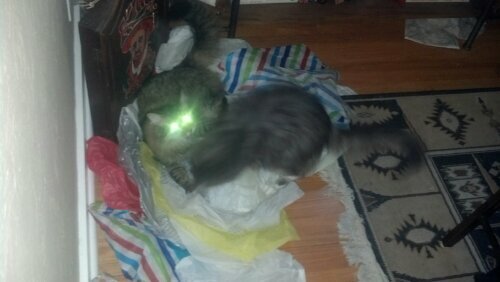 Kitten Thunder is still enjoying their pile of tissue paper. Today it caused a battle. 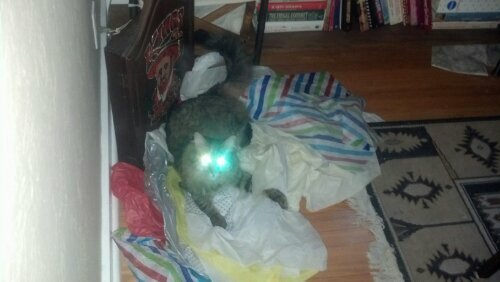 A battle of laser kitty proportion. Who won? They both did. 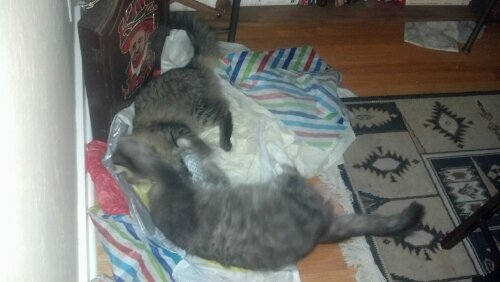 When they decided to climb into the gift bag instead.